Colorado’s reputation as a top producer of stellar craft brews goes hand in hand with our growing status as a culinary trendsetter. From the annual sell-out at Denver’s Great American Beer Festival — the largest domestic beer festival in the United States — to popular restaurant pairing events, Colorado has a knack for marrying small-batch suds with delicious dishes for an unforgettable gourmet experience. Here, we reveal a few of our favorite homegrown beer and food matches from around the state. Tucked away in the mountain hamlet of Lyons, Oskar Blues is known for its full-flavored creations, rustic bar atmosphere and jamming live music (the Foo Fighters once played a secret show here). Beer drinkers of all walks love gold-medal-winning Dale’s Pale Ale for its big hoppy punch. Food Pairing: Pull up a bar stool at Oskar Blues Grill & Brew and drink from the source. Pair your pint of Dale’s with one of their signature Southern comfort dishes such as shrimp and grits with a side of hearty gumbo. Long before New Belgium grew its wind-powered empire, founder Jeff Lebesch was a basement homebrewer with adventurous ideas inspired by a bike ride through Belgium. Fort Collins brewmasters have perfected easy-drinking dark beer with their complex, but light and crisp, 1554 brew. Food Pairing: Head over to Austin’s American Grill in Old Town Fort Collins and sip a 1554 with their hickory-smoked Danish baby back ribs basted with chipotle barbecue sauce. Denver’s oldest brewpub was founded in 1988 by a group of young entrepreneurs, including now Colorado Governor John Hickenlooper. Wynkoop blazed the trail for edgy craft brewing, focusing on “goose-bump-inducing” moderately strong beers. A house specialty, Patty’s Chile Beer is a light German-style concoction made with Anaheim chiles and smoked peppers. Food Pairing: The brewery’s handcrafted menu boasts a fresh lineup of Colorado-produced meats and vegetables. Order the over-stuffed burrito smothered in vegetarian green chili to complement the chile beer’s spicy zing. Started in 1995 by two guys with a love for good beer and beat-heavy Jamaican-derived music, Ska Brewing in Colorado’s southwest corner pushes the robust envelope with taste bud-tapping beers like their Decadent Imperial IPA. Food Pairing: Beer-friendly dishes at Durango’s Lady Falconburgh's Barley Exchange stand up nicely to the IPA’s beastly hops. Try the hot chicken oriental salad and notice how it mingles with the brew’s bitter grapefruit and caramel malt notes. This Summit County hangout named for an infamous 19th-century outlaw is loved for its tried-and-true small-batch creations. A cozy fireside pub surrounded by the Ten Mile and Gore mountain ranges, Pug’s ambiance is only topped by their beer. The all-season Morning Wood Wheat is a great lightly filtered go-to with hints of lemony grain. Food Pairing: Dillon’s oldest steak house keeps regulars coming back with their beloved specials. Enjoy the Morning Wood Wheat with their legendary fresh wheat-beer-battered fish and chips. Bristol rests in the shadows of Pikes Peak and takes pride in making the purist, one-of-a-kind ales using only natural ingredients. A sip-and-savor beer, Laughing Lab Scottish Ale is a deep red brew made with a blend of specialty malts to give it a nutty, roasted flavor that’s mildly sweet with a feathery finish. Food Pairing: Visit The Bristol Pub inside the Ivywild School, a historic former elementary school turned community marketplace and gathering spot. Pair the Laughing Lab Scottish ale with Laughing Lab Soft Pretzels — warm and chewy, these dipping delights are accompanied by Beehive cheddar sauce and spicy mustard. Read Restaurants in Colorado with Great Patio Views and 10 Must-Eat Foods In Colorado. 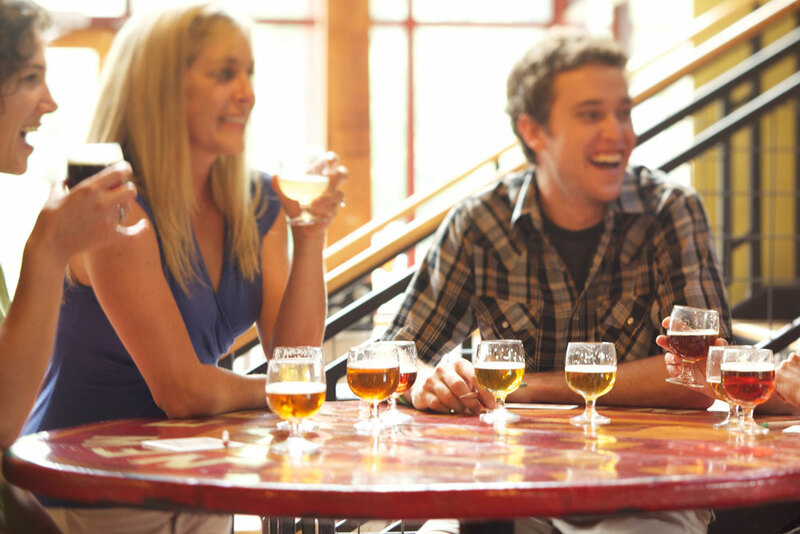 Photo: Courtesy of New Belgium Brewing Company.